L: Learning is especially important for today’s leadership. Your business provides the curriculum is a wide learning curve for the most responsible and the learning has to be continuous. Goals and objectives stem from being a student of the game. The best students are the best leaders. E: Energizing everyone to a singular purpose is the toughest task of a leader. Communication is the main component. Continuous strategy has to be maintained with enthusiasm and energy. A: Assessing where to place people and when to hire and fire takes an objective diligence and a continuance of defining, trending, and training that brings the best out of people. The right responsibilities create the right results. D: Demanding the very best from everyone is easiest when it is done by example. If leadership demands the utmost from itself, everyone is aware that the culture is one of hard work and commitment. In essence, giving everything is the simplest and best of strategies. 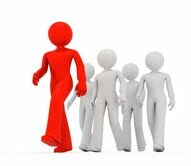 As we head deeper into 2012, and we add the personnel that will win for the entire organization, to LEAD with focus and purpose will help ensure that success will come to the many and not to the few! The complexity and the simplicity of both management and leadership must become the hybrid of opportunity for business success.